SpreadsheetDataWriter writes data to spreadsheets – XLS or XLSX files. The component can insert, overwrite or append data, it allows you to work with multiline records, it supports formatting and writing data vertically or horizontally. It can be used for filling in forms. For port writing. See Writing to Output Port. One field (byte, cbyte). SpreadsheetDataWriter does not propagate metadata. SpreadsheetDataWriter has no metadata template. Input metadata of SpreadsheetDataWriter can have arbitrary field data types; writing lists and maps is not supported as there are no list and byte fields in .xls files. Specifies where data will be written to: an XLS or XLSX file, an output port, or a dictionary. See Supported File URL Formats for Writers. In the case of writing to an output port, Type of formatter must be set up to XLS or XLSX. A name or number (zero-based) of the sheet to write into. Unless set, a sheet with a default name is created and inserted after all existing sheets. If the property is just a number, it is treated as the index of the sheet, not the name (e.g. entering 2 creates a file with 3 sheets: Sheet0, Sheet1, and Sheet2 which contains the required data). You can specify multiple sheets separated by a semicolon (;). For details on partitioning, see Writing Techniques & Tips for Specific Use Cases. A visual editor in which you define how input data is mapped to the output spreadsheet(s). For more information, see Details. Mapping URL  An external file containing the mapping definition. Create new file (streaming - XLSX only) – replaces an existing file with a newly created one making streaming mode possible; significantly faster than other write modes. In-memory writing modes store all values in memory allowing for faster reading. Suitable for smaller files. In streaming mode (available for XLSX only), the file is written out directly without storing anything in memory. Streaming should thus allow you to write bigger files without running out of memory. Replace all existing sheets – all sheets are removed prior to writing to the file; equivalent to Create new file option in Write mode. A template spreadsheet file which is duplicated into the output file and populated with data according to the defined mapping. The template can be any spreadsheet, typically containing the header, footer and data sections (one empty line to be replicated during writing). For more tips, see Writing Techniques & Tips for Specific Use Cases. Formats of the output file and the template file must match. Usage of XLTX files is limited (see Notes and Limitations), rather than XLTX, use XLSX files as templates. If set to true, non existing directories included in the File URL path will be automatically created. A total number of records throughout all output files that will be skipped. See Selecting Input Records. A total number of records throughout all output files that will be written out. See Selecting Input Records. A key whose values control the distribution of records among multiple output files. For more information, see Partitioning Output into Different Output Files. By default, output files are numbered. If this attribute is set to Key file tag, output files are named according to values of Partition key or Partition output fields. For more information, see Partitioning Output into Different Output Files. Fields of Partition lookup table whose values serve for naming output file(s). For more information, see Partitioning Output into Different Output Files. The name of a file unassigned records should be written into (if there are any). Unless specified, data records whose key values are not contained in Partition lookup table are discarded. For more information, see Partitioning Output into Different Output Files. In case partitioning into multiple output files is enabled, all output files are open at once. This could lead to an undesirable memory footprint for many output files (thousands). Moreover, for example unix-based OS usually have very strict limitation of number of simultaneously open files (1024) per process. In case you run into one of these limitations, consider sorting the data according to partition key using one of our standard sorting components and set this attribute to true. The partitioning algorithm does not need to keep open all output files, just the last one is open at one time. For more information, seePartitioning Output into Different Output Files. Specifies the formatter to be used. By default, the component guesses according to the output file extension – XLS or XLSX. The two mapping attributes are mutually exclusive. You either specify the mapping yourself in Mapping, or supply it in an external file via Mapping URL. The third option is to leave all mapping blank. Either both or neither of these attributes has to be specified. SpreadsheetDataWriter writes data to XLS or XLSX files. XLSX: Open Document Format, Microsoft Excel 2007 and newer. A mapping tells the component how to write CloverDX records to a spreadsheet. The mapping defines where to put metadata information, data, format, writing orientation, etc. 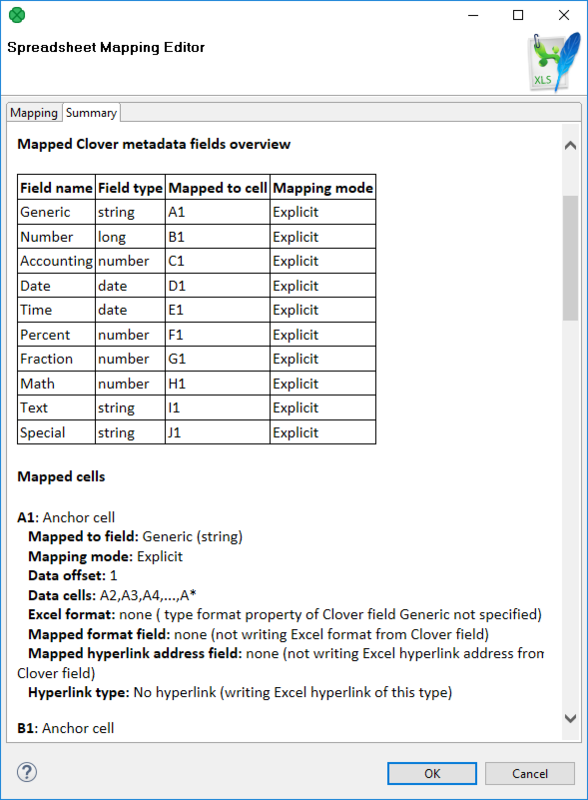 In the mapping, you define a binding between a Clover field and so called leading cell. Data for that field is written into the spreadsheet beginning at the leading cell position; either downwards (vertical orientation; default) or to the right (horizontal). Each leading cell-field binding is independent of each other. This can be used to create complex mappings (e.g. one record can be mapped to multiple rows; see Rows per record global mapping property). Explicit – statically maps a field to a fixed leading cell of your preference. Typically the most used mapping mode for the writer (see Basic Mapping Example). Explicit mode can be combined with other mapping modes. To map a field (or a whole record) explicitly, simply drag the field (record) to the spreadsheet preview area and drop it onto desired location. You can select multiple fields. Map by order - dynamic mapping mode; cells in by order mode are filled in left-right-top-down direction with input record fields by the order in which the fields appear in the input metadata. Only fields which are not mapped explicitly and not mapped by name are taken into account. Map by name - this mode applies only to writing to an already existing sheet(s). Cells mapped by name are bound to input fields using 'late binding' on runtime according to their actual content, which presumably is a 'header'. The component tries to match the cell's content with a field name or label (see Field Name vs. Label vs. Description) from input metadata. If such a match is found the mapped cell is bound to the corresponding input field. If there is no match for the cell (i.e. cell's content is not a field name/label) then the cell is unresolved – no input field could be assigned. Note that unresolved cells are not a bad thing – you might be writing into say a group of similar templates, each containing just a subset of fields in the input metadata. Mappings with unresolved cells do not result in the graph failing on execution. This mode comes in handy when you are writing using pre-defined templates (the Template file URL attribute). See Writing Techniques & Tips for Specific Use Cases. Both Map by order and Map by name modes try to automatically map the contents of the output file to the input metadata. Thus these modes are useful in cases when you write into multiple files and you want to design a single 'one-fits-all' generic mapping, typically for multiple templates. Replacing input metadata with another does not require any change in the mapping – it is recomputed accordingly to the mapping logic. Implicit – default case when the mapping is blank. The component will assume Write header to true and map all input fields by order, starting in top left hand corner. 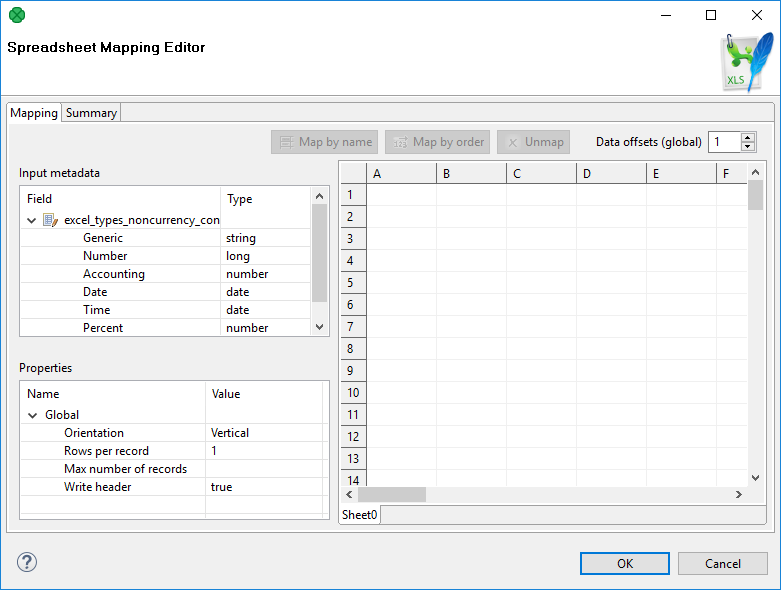 Spreadsheet mapping editor is the place where you define your mapping and its properties. The mapping editor previews sheets of the output file (if any; otherwise shows a blank spreadsheet). However, the same mapping is applied to a whole group of output files/sheets (e.g. 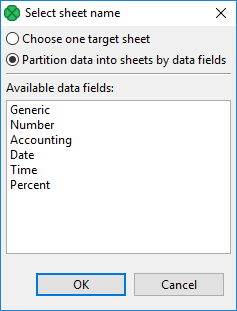 when partitioning into multiple sheets or files). In the editor, you map the input fields on the left hand to the spreadsheet on the right hand. Either use mouse drag'n'drop or the Map by name, Map by order buttons to create leading cells in the spreadsheet. Summary tab – a place where you can review the Clover-to-spreadsheet mapping you have made. Cells in the preview area highlighted in various colors to identify whether and how they are mapped. Orange are the leading cells forming the header. Properties can be adjusted on each orange cell to create complex mappings, see Advanced Mapping Options. Cells in dashed border, which appear only when a leading cell is selected, indicate the data area. Yellow cells demonstrate the first record which will be written. A typical example of what you will want to do in SpreadsheetDataWriter is writing into an empty spreadsheet. This section describes how to do that in a few easy steps. Click the whole record in Input metadata (excel_types_nocurrency in the example below) and drag it to the spreadsheet preview area to cell A1 and drop. Furthermore in Properties, notice that Orientation is Vertical. This makes the component produce output by rows (opposite to Horizontal orientation, where writing advances by columns). Notice that Data offsets (global) is set to 1. That means that data will be written 1 row below the leading cell, making room for the header cell. Actually, you will achieve the same result if you leave the mapping blank (implicit mapping). In that case, the first row is mapped by order. This section provides an explanation of some more advanced concepts building on top of the Basic Mapping Example. Data offsets determines the position where data is written relative to the leading cell position. Basically, its value represents a number of rows (in vertical mode) or columns (in horizontal mode) to be skipped before the first record is written (relative to the leading cell). Data offset 0 does not skip anything and data is written right at the leading cell position (Write header option does not work for this setting). 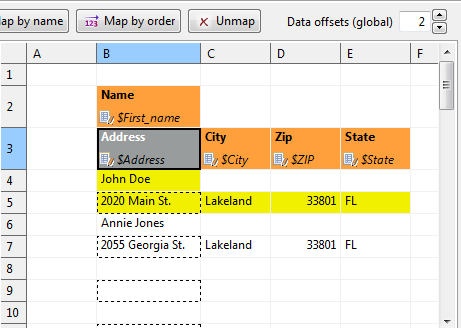 Data offset 1 is typically used when header is to be written at the leading cell position – so you need to shift the actual data by one row down (or column to the right). Click the arrow buttons in the Data offsets (global) control to adjust data offsets for the whole spreadsheet. Additionally, you can use the spinner in Properties → Selected cells → Data offset of each leading cell (orange) to adjust data offset locally, i.e. for a particular column only. Notice how modifying data offset is visualized in the sheet preview – the 'omitted' rows change color. By following dashed cells, which appear when you click a leading cell, you can quickly check where your record will be written. Figure 56.18. The difference between global data offsets set to 1 (default) and 3. In the right hand figure, writing would start at row 4 with no data written to rows 2 and 3. Figure 56.19. Global data offsets is set to 1. In the last column, it is locally changed to 4. In the output file, the initial rows of this column would be blank, data would start at D5. Figure 56.20. With Rows per record set to 2 in leading cells Name and Address, the component always writes one data row, skips one and then writes again. This way, various data does not get mixed (overwritten by the other one). For a successful output, make sure Data offsets is set to 2. Figure 56.21. Rows per record is set to 3. Data in the first and third column will start in their first row (because of their data offsets being 1). The second and fourth columns have data offsets 2 and 4, respectively. The output will, thus, be formed by 'zig-zagged' cells (the dashed ones – follow them to make sure you understand this concept clearly). Max number of records is a Global property which you can specify via component attributes, too (see SpreadsheetDataWriter Attributes). If you reduce it, you will notice the number of dashed cells in the spreadsheet preview reduces, as well (highlighting only the cells which will be written out in fact). You can specify the format for a metadata field (its Format property in metadata). That means all values of the field written to the sheet will have the specified format. You need to prefix the Format in metadata with excel: (e.g. excel:0.000% for percents with three decimals) because the component ignores standard format strings (as the Clover-to-Excel format conversion is not possible). You provide two input fields for a single cell: one specifying the cell value and the other defining its format. This utilizes the full power of Excel where formats are set per-cell rather than per-column. You pass the format in the data as an extra 'string' value. Remember, the format is specified in Excel terms, not Clover. Use Field with format in Properties → Selected cells of the leading (orange) cell to specify the input field containing the format (string). Which format is used if both are set? Do you have the format mapped by the Field with format property? Yes – the component uses it. Is Field with format not specified or a value of that particular field is empty (null or empty string)? Yes – use Format from the metadata field (if set with the excel: prefix). See also Field Details. You can use the excel:General format – either in Field with format or in metadata Format – the output will be set to general format (Excel terms). When Excel format is specified in Metadata → Format it MUST be prefixed by excel: so that CloverDX can know that the format string is specific to Excel-only use. Example: "excel:0.000%"
When Excel format is passed in data, as the aforementioned fieldFormat, it MUST NOT be prefixed in any way. Example: "0.000%"
Note that the excel: format string matters when reading the output back with spreadsheet readers - SpreadsheetDataReader. Common readers (such as FlatFileReader) completely ignore excel:. They consider it an empty format string. SpreadsheetDataWriter lets you write hyperlinks into particular cells. Each hyperlink is defined using two input fields. One input field defines the text of the link, other field defines the target of the link. Links can be of several types: Document, Email, File or URL. Link is created in the Properties pane. Map the field with a link text to desired cell, change Hyperlink type (in Properties) to desired type and select field with target in Field with hyperlink address. Hyperlinks are persisted to a file along with font and style (blue and underline). K2 for a link to cell K2 in the same sheet. 'my sheet'!K2 for a link to cell K2 in a sheet with name my sheet. report_details.txt for a relative link to a file in the same directory as the spreadsheet file. C:/path/to/file/report_details.txt for an absolute link to a file. Sometimes you may want to prepare in advance a nicely formatted template in Excel, maybe including some static headers, footer, etc. and use CloverDX to just fill in the data for you. And it might be that you will want to reuse the template without overwriting it. This is where SpreadsheetDataWriter template feature comes in handy. 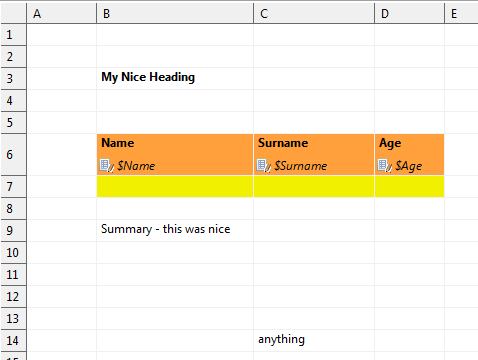 The component can take a previously designed template Excel file (see Template File URL in SpreadsheetDataWriter Attributes), make a copy of it into the designated output file (see File URL) and write data to it, retaining the rest of the template. A template can be any Excel file, usually containing three sections: the header, one template row for data and the rest as the footer. Figure 56.22. Writing into a template. Its original content will not be affected, your data will be written into Name, Surname and Age fields. Notice the template row. 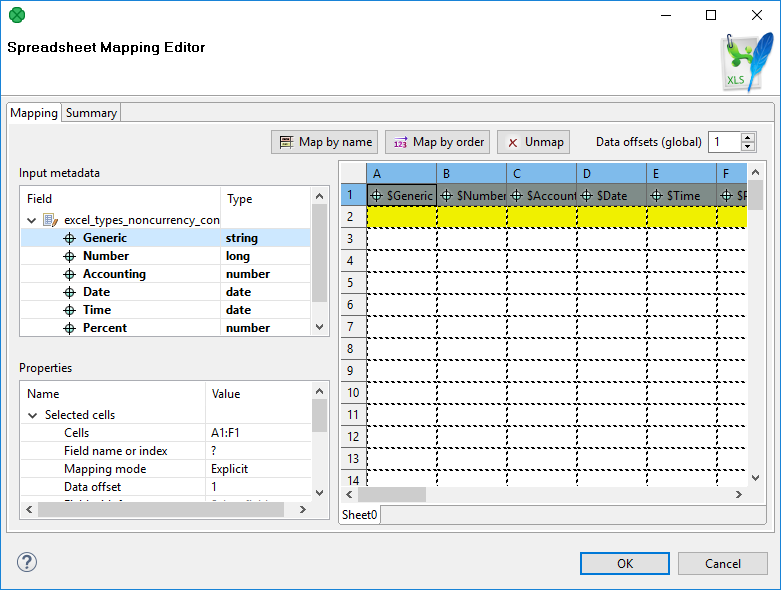 It is a row like any other but in the mapping editor, it is designated as the first row of mapped data. The component duplicates that row each time it writes a new data. This way you can assign arbitrary formatting, colors, etc. on this data row and it is applied to all written rows. The template file is not changed or affected in any other way. Mapping – this is one of the cases where Map by name makes sense. Use the header of the template where applicable. Of course, you can map fields as usual. Send just one input record to the component's input containing all the form values. Set File URL to the form file to be filled. Then map the input fields explicitly one by one into corresponding form cells using the preview sheet. 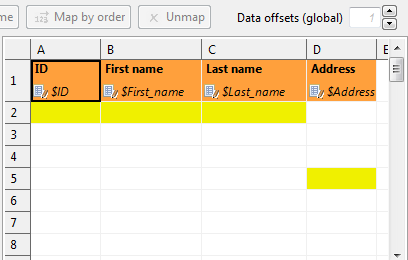 Data offsets (global) – 0 (this ensures data will be written right into the leading cells you have mapped – the orange ones). If you use Insert, Append or Overwrite modes, formulas and charts that work with the data areas written in CloverDX will be properly updated when viewed in Excel. Generating formulas, charts or other Excel objects is not currently supported. You can use multiple sequential writes into a single sheet to produce complex patterns. To do so, set up multiple SpreadsheetDataWriter components writing the same file/sheet and feed them various inputs. Do not forget to put multiple components writing to the same file into different phases. Otherwise the graph will fail on write conflict. Typically, you will use the Overwrite in sheet (in-memory) write mode for all components in the sequence. 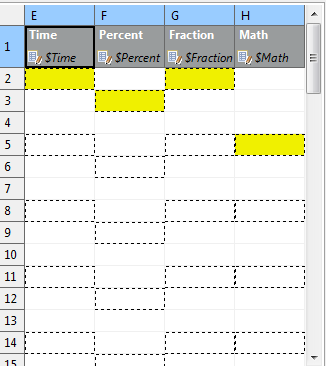 A useful technique is partitioning into individual sheets according to values of a specified key field (or more fields). Thus you can write, for example, data for different countries into different sheets. Simply choose Country as the partitioning key. This is done by editing the Sheet attribute; switch to Partition data into sheets by data fields and select a field (or more fields using Ctrl+click or Shift+click). etc., each of them containing data just for one shop. See also Partitioning Output into Different Output Files. Although Excel format is not primarily designed for big data loads, its processing can easily grow to enormous memory requirements. Maximum number of rows: unlimited (but be aware that Excel itself works only with first 1,048,576 rows the file contains). All the data can be read back by SpreadsheetDataReader or other tools that support large files. When mapping in the Spreadsheet mapping editor, memory consumption for the Designer might temporarily rise to over a gigabyte of memory – so be sure to set enough heap space for the Designer itself (see Main Tab in Run Configuration). Memory consumption is affected by how Excel organizes the file internally so two files with the same amount of data in it can have significantly different memory requirements. Use streaming mode whenever possible. It is several times faster than other write modes. Switch to DEBUG mode in graph's Run Configurations to detect whether the streaming mode is on or off. To learn how to do that, see Main Tab in Run Configuration. When using the Overwrite sheet (streaming - XLSX only) write mode, the entire spreadsheet file still needs to be loaded before writing which can cause major memory requirements. Make sure to set enough heap space for CloverDX runtime if you are working with larger spreadsheet files (see Chapter 14, Runtime Configuration). Usually you would use the Create new file (streaming – XLSX only) and Overwrite sheet (streaming - XLSX only) write modes. Other write modes do not support streaming. For technical reasons, it is currently not possible to use an XLTX template for XLSX output. Nevertheless, the difference between XLTX and XLSX files is minimal. Therefore, we recommend you use XLSX as the format for both the template and output files. For XLS and XLT files, there is no such limitation. A spreadsheet mapping editor on server files can operate as usual, except for a case when File URL contains wildcard characters. In that case, CloverDX Designer is not able to find matching server files and the mapping editor shows no data in the spreadsheet preview. This is going to be fixed in next releases. There is no error port on the component. By design, either the component configuration is valid and will then succeed in writing records to a file, or it will fail with a fatal error (invalid configuration, no space left on device, etc.). No errors per input record are generated. If the SpreadsheetDataWriter writes to newly created sheet, or to existing sheet which is cleaned first (i.e. Actions on existing sheets is set to Clear target sheet(s)), the component automatically adjusts width of columns so that it matches width of the most widest cell content in each particular column. Column widths is not adjusted if a template is used or when writing into existing sheet (which is not cleaned first). This means that column widths from template are preserved. Also column widths of already existing sheets are kept when appending/inserting/overwriting data of that sheet. SpreadsheetDataWriter cannot write lists and maps. Lists of strings, bytes and cbytes are converted to string. SpreadsheetDataWriter ignores excel:raw format. When it's set, the component acts as if the format property is empty. 4.0.7 You can now write hyperlinks into spreadsheets. CloverDataWriter can now write to output port just to byte or cbyte field. If you write spreadsheet to a dictionary, the attribute Type of formatter must be set to XLS or XLSX. It cannot be Auto (default value).